answered YES to these questions, then this is for you! TIME IS MONEY – are you using it wisely? How you spend your time today will determine the quality of life you will live tomorrow. Imagine your life 20-30 years from now. Are you still working and making ends meet or are you living comfortably, enjoying your time and money? When the picture you see isn’t so good, know that you can change it today! In this module, learn the key concepts that will help you take advantage of the time you have now and start growing your money in investments that are best suited for you. 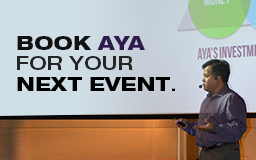 Aya Laraya, with his 25 years of experience in the financial and investment industry, will simplify and help you understand how you can grow your money and learn how to think like a good investor.